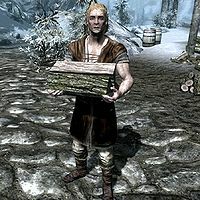 Leifur is a Nord lumberjack working for Aeri at Anga's Mill. He shares the Anga's Mill Common House with fellow lumberjack Kodrir and sleeps there every night between midnight and 6am. After a one-hour breakfast, he heads outside and starts working; At 7am, he carries wood back and forth between the wood chopping block and the common house. At 9am, he will work the mill and at 11am, he will once again carry firewood. At 1pm, he will return to working the mill, until he carries firewood for the last time at 3pm. At 5pm he will work the mill for two more hours until 7pm, when he enjoys a one-hour dinner in the Common House, where he also spends the rest of the evening. He wears a set of farm clothes and a pair of boots. He is equipped with an iron dagger, and carries a key to the common house as well as a selection of lower-class loot and gold. This page was last modified on 30 December 2017, at 03:16.